I listen to Greg Kihn the morning DJ on 98.5 KFOX, who is best known for the hit single “Jeopardy”, because he helps start my day with music I can enjoy. 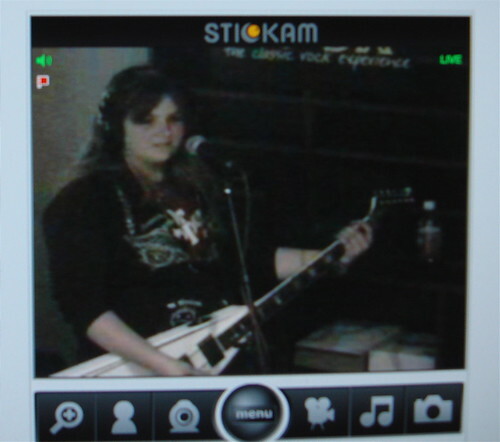 Greg’s upbeat show features interviews with rock stars, and local groups often play live on air at the KFOX studio. This Sunday, July 1, the 6th Annual Kihncert On The Green will return to Discovery Meadow Park. ‘Crimes of Passion’ one of KFOX the Last Band Standing Under 18 Finalists will be among the nine bands featured. I stumbled upon a little banner on the HP home page celebrating 35 years of the HP calculator. It’s amazing to think that the handheld calculator is only 35 years old. It’s one of those inventions that we just take for granted, particularly since most of the work done today is done on PCs (in my case, a Mac). I remember spending many hours while in college plowing through pages of physics, chemistry, calculus and engineering courses with my HP calculator (mine was a 32s, and I still use it to this day — it’s 1 year shy of being in continuous use for 20 years, and the day it decides to no longer function, it will be replaced with another HP calculator). Yet another innovation from the Santa Clara Valley! Visit the HP calculator anniversary site. Fireworks have been associated with the Fourth of July since 1777, a year after the signing of the Declaration of Independence by the Continental Congress in Philadelphia. Since then, parades, barbecues, picnics, and other activities have become traditional ways to celebrate America’s birthday. American Festival for Independance. Guadalupe River Park’s Discovery Meadow. Free admission. Music, food, and arts and crafts. Fireworks at dusk. Event information and special VTA bus and light rail information. Picnic and Fireworks Extravaganza. Central Park, 909 Kiely Boulevard. Free admission. Pancake Breakfast at 8 am, followed by games and entertainment throughout the day including a carnival area, petting zoo, face painting, and swimming at the International Swim Center. Bring a picnic lunch or purchase foods at the event. Fireworks at 9:30pm. Event information. Independence Day Festivities. 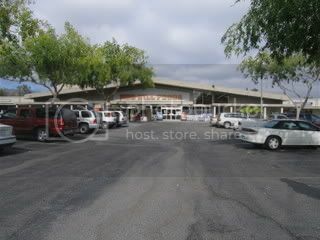 Milpitas Sports Center, 1325 E. Calaveras Blvd. Free admission. Water activities at Milpitas Sports Center Pools during the day. Fireworks at 9:30pm. Event information. One of the things I like most about my neighborhood is our local grocery store, Nob Hill (Snell and Santa Teresa). Ever since we moved into our home (13 years ago) we have shopped at Nob Hill almost daily, and without hesitation I have to say that the Snell and Santa Teresa Nob Hill has the best customer service around. Having shopped at this Nob Hill for so long means that we know almost every single employee by name, and they know us. 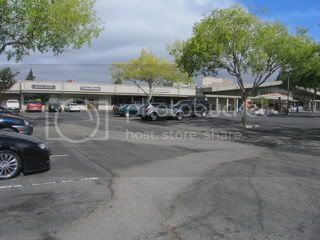 This particular Nob Hill is very close to my house, it is well stocked and always very clean. The prices are pretty good, and if you shop the sales you can save a nice chunk of money. One of the things I am really enjoying is the new magazine that Nob Hill (Raley’s) puts out, as it is filled with recipes and I love to cook! (Am going to try one of the recipes tonight, a “Zip Sauce” for steak). Say you need to drive 10 miles from work to home. At an average speed of 55 mph (freeway and otherwise), you will need about 11 minutes. If you drove at 50 mph, it will be 12 minutes. Even if you had to do double the distance, you’ll need only an extra 2 minutes. If this is the case, does it make sense to push the limit? Even if you can’t stick to the posted limit always, try doing it just one day — tomorrow (29 June, Friday) is “Drive Speed Limit Day” says San Jose Mercury News. Almost needless to say, an optimum speed saves gas too, whereas driving too fast brings down your fuel economy. If you’ve been thinking of making a career move to Medical Examiner/Coroner, or if you just get a kick from watching the cast on CSI pass body parts around you will want to visit this exhibit at The Tech coming this Fall. Mercury News (June 6) columnist, Sal Pizarro said, “Tech Museum show likely to disgust all”- and then calling it, “The fascinatingly gross Body Worlds…” I disagree with Sal. If skin can be beautiful, why then can’t a pancreas? The exhibit of plastinization provides the medical and anthropological communities the opportunity to view the bodies of people who specifically and knowingly donated their bodies for the purpose of educational material. Where else could I, a simple layperson, find a more educational dramatic way to see what makes us tick – arranged in an artful way? This is not a cheap knockoff, not one of a number of imitation exhibitions around the country that got their bodies from China, where they use unclaimed and unidentified bodies. Body Worlds won’t be on exhibit in San Jose until this September. So you will have all summer long to psyche yourself, or the kids, up. More ticket information after the jump. IBM Building 025: San Jose’s historical landmark unrealized. The historical importance of building 025 goes un-noticed by most residents of south San Jose as they are mostly new to the area. I too found myself wanting when it came to understanding the role that IBM Building 025 played on the world stage of early tech in the late 50’s and on through the 90’s. The building has architectural significances like no other from the mid 50’s era. It’s modern industrial style was un-matched and stood out as an example of creativity at it’s best. Tech-lab’s and most offices in the buildings interior were constructed with the ideal that the visual characteristics of the exterior and the surrounding landscape should be included in the overall theme, look, and feel of the site throughout. Large glass exterior/interior walls were common, allowing the outdoor landscape to become part of the interior. With the goal of creating a workplace that was comfortable and stress-free, building designer John Savage Bolles crafted and molded building materials, art, and nature into an award winning site. Remember the when the dot-com boom was in full swing right around 1998/99? Bay Area tech firm treated employees like royalty. The work place/space was a wonderland of comfort wrapped-up in a stress-free environment. Employees never wanted for anything! I have a sneaking suspicion that IBM may have started that trend in the late 50’s and throughout the 60’s and 70’s. Rumor has it that employees of Building 025 were very well taken care of, but I’ll have to ask my father-in-law who was a chemists for IBM back then. I believe his team was instrumental in the development of the IBM Selectric electric typewriter. IBM Building 025 was named plant of the year by Factory Maintenance & Management back in 1958. For more than two decades, the development of thousands of new homes in San Jose’s pristine Coyote Valley has been tied to the creation of tax-producing jobs that would help the city pay for police, street repair and other crucial services there. The restrictions also state that none of the 25,000 homes envisioned for Coyote can be built until the city’s long-term budget outlook is stable. And with San Jose projecting an $87 million deficit in five years, those limits have kept Coyote construction off the table indefinitely. But today, despite the urging of top planning officials, the council appears set to launch a review of whether those restrictions should be overhauled – and how soon. Anyone who lives in San Jose realizes that our city is struggling to proved the most basic services, and we cannot ignore the impact to our city if the city council eliminates or changes the triggers that are in place for Coyote Valley. 20×16 Oil on Canvas Coyote Valley is an old farming region south of San Jose and north of Morgan Hill. Much of the land is still being cultivated but most is slated for development into corporate “parks” and all that come with them. 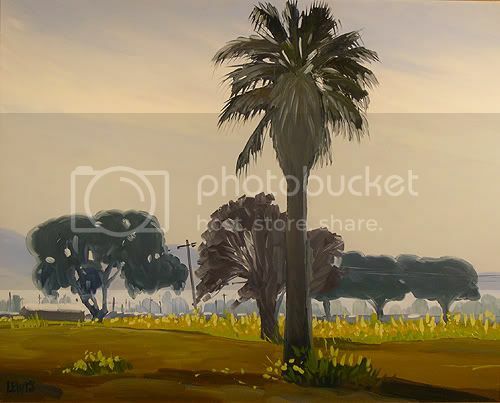 This lonely palm stands in a field near the foundations of an old farmhouse now gone. The view is looking south. First, and foremost, housing does not provide enough revenue to be self sufficient, and without the tax generating base of business, adding housing in Coyote Valley without jobs means less services for every other part of San Jose. Beyond the economic impact of adding housing before jobs, there are also the environmental issues that need to be addressed. If you would like some back round on this issue, you can read the Coyote Valley Specific Plan online by clicking here. This link has meeting dates, copies of reports and much more, and is a must read if you want to find out exactly what is going on with Coyote Valley. The development of Coyote Valley will impact everyone who lives in San Jose, and as residents we need voice our concerns and opinions to the city council. If you were in the South Bay from 1961 to 1980, you may remember Frontier Village. 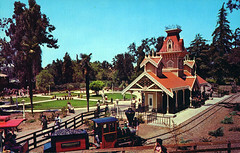 Frontier Village was a western theme family amusement park with attractions that included a stagecoach, canoes, a mine ride, railroad, also some ‘thrill’ rides. Remembering Frontier Village has gathered at the old site to reminisce about the amusement park with a summer picnic the past six years. This years’ picnic is this Saturday, June 30 beginning at 11:00am at the old Frontier Village location now known as Edenvale Park (200 Edenvale Avenue, San Jose). There will be booths set up with memorabilia, past employees will be on hand to reminisce, the Frontier Village gun fighters re-enact their old gun fighting show, a guided tour of the park pointing out where all the old attractions once stood, along with other actives. There are plenty of tables, chairs, and barbeque grills. There will be hot dogs and drinks for sale or you can bring your own food. Parking and admittance are free. For location map and more information check here.